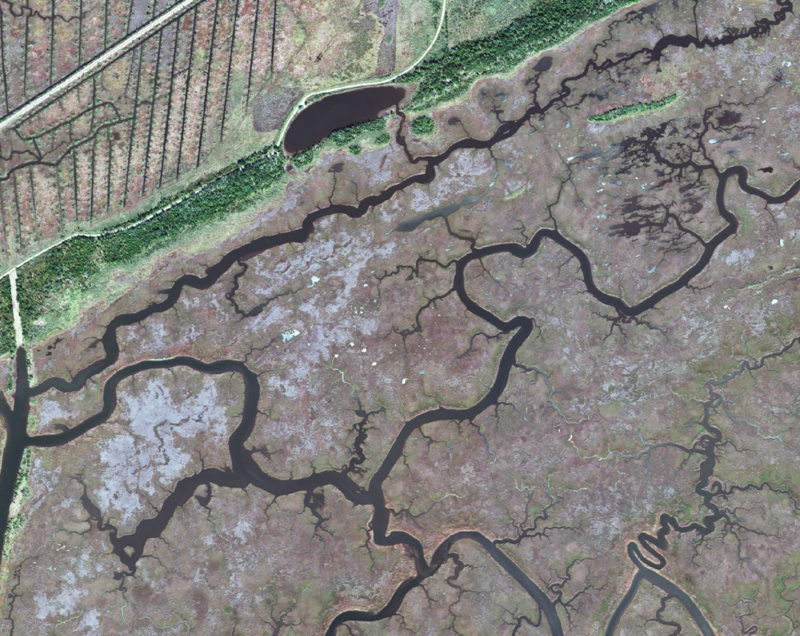 The marsh preserve is in southern Hancock County, Mississippi and is the second largest marsh in the state. Construction has begun on a living shoreline project in this area to stabilize the retrograding shoreline of the marsh preserve. The project is applying sustainable construction principles to create new shoreline, wetland habitat, and natural services important to healthy estuarine habitats. The NOARC Tidelands Trust Project is using techniques tested and verified in the NERR test range to provide baseline measurements of the pre-construction shoreline and precision landcover analyses of adjacent wetland habitats. The Hancock County Marsh Preserve, located in southern Hancock County, Mississippi is the site of the Living Shoreline Project sponsored by the National Resource Damage Assessment Program. This restoration project focuses on deploying living shoreline configurations including natural and artificial breakwater material designed to dampen wave energy impacting the Preserves shoreline. The projects long-range goal is to reestablish wetland habitats lost over time to tropical storm events and create 5.9 miles of living shoreline and approximately 46 acres of marsh. The NOARC team, using techniques validated in the NERR Applications Research Test Range, is developing a set of measurements over the project area to provide the baseline assessment for the Living Shoreline Project. As the new shoreline is constructed and new marsh created, we will compare its evolution to the pre-existing conditions in the Preserve. Long-term trend analysis will continue and will provide state resource managers with precision data to address their adaptive management decisions in the years to come. These data are an integral part of a complete resource management strategy that allows course corrections as restoration projects evolve. 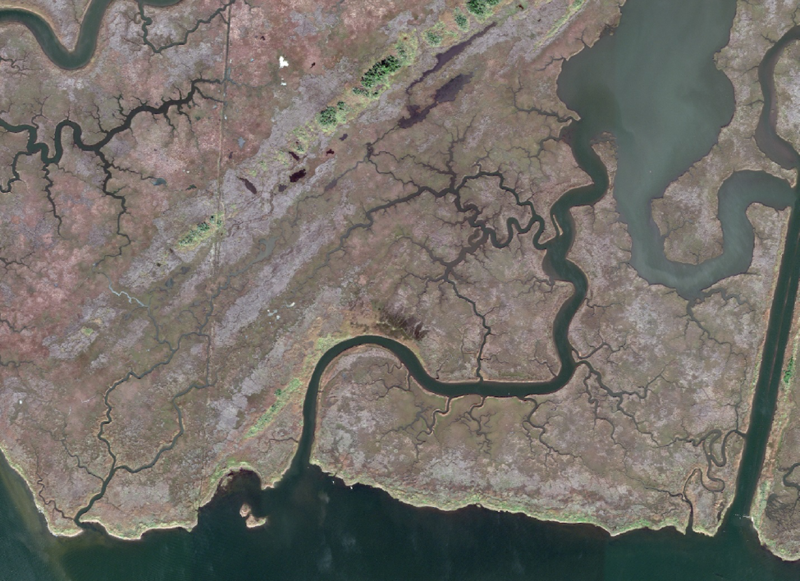 DigitalGlobe WorldView 3 satellite-derived data is being used to measure the Preserve shoreline and the associated wetland habitats and provide the base map for the project. This high resolution (2.0-m ground sample distance) satellite data serves as our geographic reference map for additional precision measurements made with unmanned airborne systems. The Heron Bay Point image is one section of the base map for the Preserve. 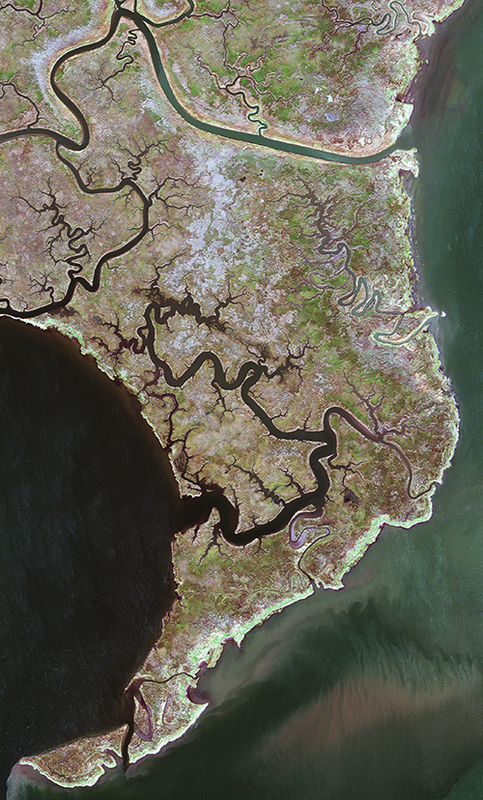 Point Clear Island is the largest tree island in the Hancock County Marsh Preserve and serves as one of the sentinel sites for assessing changes in area hydrology and potential impacts of sea-level rise. Monitoring the Point Clear Tree Island for changes in its areal extent and vegetation changes over time is a key component in overall preserve health management. Monitoring configuration changes in Landmark Bayou as the new shoreline is completed and evolves is an important indicator of the long-term effects of the living shoreline project. 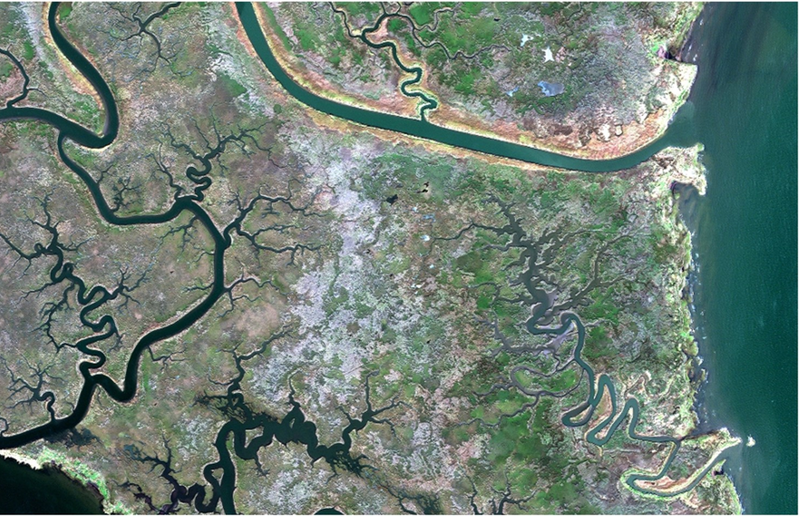 Precision measurements with satellite and airborne data systems have been used to construct the reference maps for later change monitoring. Ainsley Ridge is a small, tree island in the northern section of the Preserve. Its remote location and relative inaccessibility make it an especially important reference site for determining change is the Preserve’s habitats. We will make precision measurements on this site with small UAS to avoid foot traffic and intrusion into a pristine habitat. Outside Campbell Bayou is the first area in the Preserve to experience living shoreline construction and will serve as the oldest monitoring site for the project. Adjacent wetland habitats and newly constructed wetlands will be monitored as the shoreline configuration and wetland habitat extent improves. 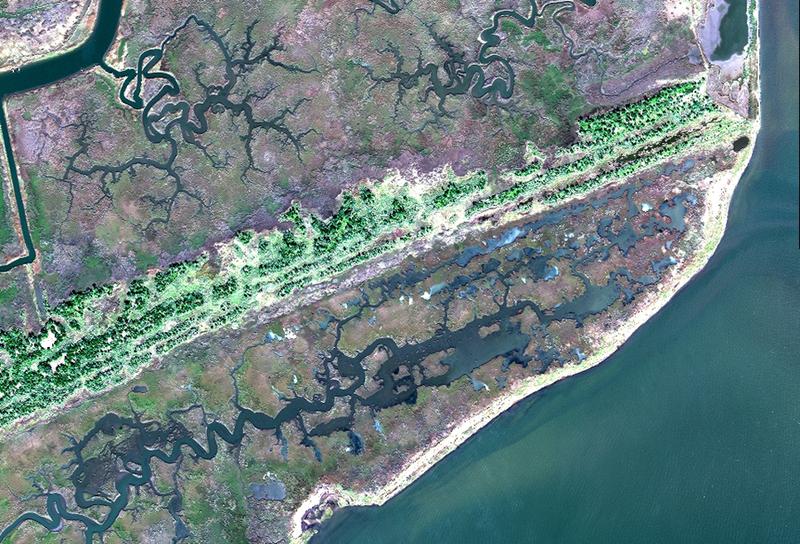 Near infrared image of Heron Bay Point located in Hancock County Marsh Preserve, MS. Shoreline is depicted by the yellow line. Grid size is 100 meters. 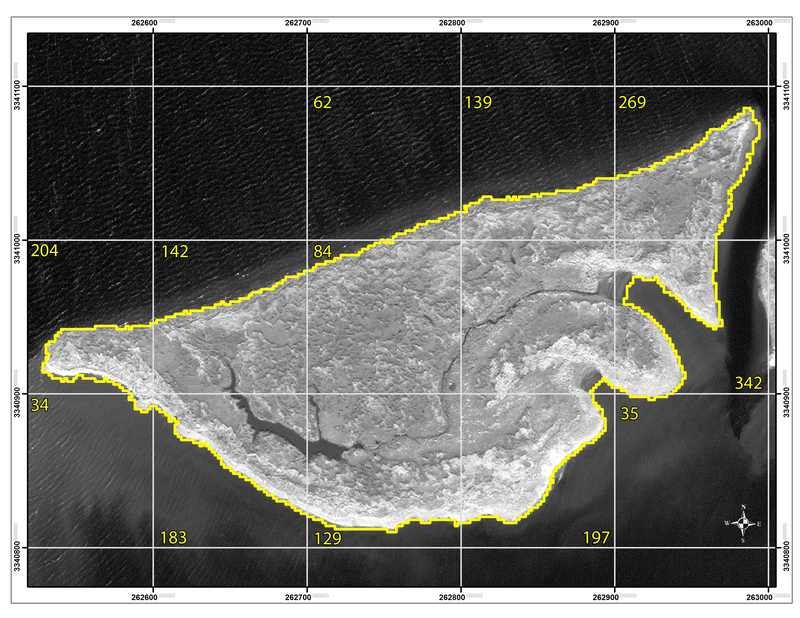 Yellow text indicates length of shoreline (in meters) within each grid cell.